"I've got a job to do. I don't care how well I'm liked." I have fond memories from my childhood of playing with my amazingly large set of UFO toys—a series of excellent, die-cast ships of all sorts that fired plastic projectiles and were all rather humorously branded with a simple logo stating "UFO." I can't remember how these toys came into my possession, but it was only a few years ago that I realized they were based on a television show; indeed, a show by the British masters of the sci-fi/action genre, Gerry and Sylvia Anderson. Viewing this sizable collection of episodes was, as you might expect, quite strange. On one hand, I'd never seen the series, but on the other, all of the vehicles and ships were familiar to me. While UFO was a cult classic and a cultural standard to many, for me, it's all a new domain to explore, but the trip has been well worth it. UFO marks the first program by the Andersons to use live actors rather than puppets or other animation and the effect is quite strange, but in a good way. In fact, I was initially astounded by how much the series represented programs like Captain Scarlet right down to the futuristic sets and technology, only on a human scale with real actors. Stranger still was the presence of a few voice actors from Gerry Anderson's Century 21 productions actually being featured in roles. The leap from "Supermarionation" to people is smoother than one might think, but it takes awhile to get used to, especially since most of the special effects are done in miniature, similar to Scarlet or Thunderbirds. In any case, the storyline for UFO could not be more Anderson-esque. It revolves around the activities of SHADO, the Supreme Headquarters Alien Defense Organization, a mysterious group that protects Earth from alien activity in any form. The main group is located beneath a popular Elstree film studio where Col. Ed Straker (Ed Bishop) runs a crack unit of E.T. hunters. The other main groups consist of Skydiver, a giant submarine with the ability to launch an aerial component, and Moonbase, where the first line of interstellar defense is housed. Also on board is S.I.D. (Space Intruder Detector), a computerized satellite that keeps watching the skies with mechanical accuracy. Why is Earth so threatened by UFOs? No one quite knows, but we do know they're hostile. It is implied that the aliens are looking to harvest human organs, but in truth, no one plot point is introduced in the series to explain who or what the alien menace is. Unfortunately, a shoot-first-ask-questions-later defense must be employed. SHADO members may not like Col. Straker's cold, demanding decisions, but when it comes down to it, he wants to save as many lives as possible. Let's take a look at the line-up for this set, designed in the preferred running order as dictated by popular opinion and not the filming order. The first episode serves to introduce the central characters and all of SHADO's defensive capabilities. A UFO penetrates Earth defenses and is eventually shot down in the water. SHADO retrieves the alien pilot in the hopes of learning something more about them. Their discoveries about these intruders are quite interesting, though chilling, and we are basically given an idea of how dire this struggle against space fiends is. Although the episode is dreadfully slow at points (a flaw that director Gerry Anderson readily admits is his fault), it's still a good, well organized introduction to the show. This is an interesting episode that adds a lot of character to the show as well as a distinctly human element. When a UFO is targeted by Moonbase personnel, they manage to destroy it, but not before a pilot is killed in the battle. Col. Straker subjects the Moonbase commander and the remaining pilots to thorough psychological tests to determine who was at fault. He seems unreasonable, but he doesn't want personal emotion to get in the way of their professional conduct. In this clever entry, we don't even see SHADO personnel for half the episode. Instead, it's constructed like a smart psychological thriller in which a simple technician for SHADO's space flight programs is being tormented by some mysterious force. His wife has been threatened and he's convinced he'll have to give flight plans over to unknown persons contacting him on the telephone. Straker's decision to use this turncoat are very controversial but, it would seem, necessary to protect important rocket missions. A UFO manages to breach Moonbase security and heads towards Earth. A curious pilot in an experimental vehicle decides to get a closer look at the alien craft, ignoring orders to move away from it. SHADO must attack, and in the process, they damage the craft, sending it crashing to Earth. The pilot (Paul Foster) survives, but only to find out that his story is being covered-up and disbelieved everywhere he goes. He's positive he saw a UFO, but SHADO tightens the web of secrecy, and all evidence of the flight disappears. It becomes obvious to Col. Straker that Foster will not give up his quest and something must be done. This relatively good episode serves to introduce the character of Paul Foster, who eventually goes on to be an integral part of the show. It also features a brief role by character actor Vladek Sheybal as one of SHADOs relentless spin doctors. As Foster gets his first tour of Moonbase, tragedy strikes when a pressure window shatters and one of SHADO's pilots is killed. Foster just barely survives, but eventually leads an investigation that discovers an alien sniper was responsible for the disaster. Finding the alien on the lunar surface, Moonbase personnel move in on his location determined to win the final showdown, but no one truly knows what the results will be. Decent at first, the pace really slows down towards the end. In a more dramatic, technical episode, we find SHADO involved in cleaning up space-debris when a UFO manages to destroy a lunar module. Unfortunately, as SHADO does their job, they find their whole operation threatened with shutdown when another government agency fails to understand SHADOs importance. A slow episode, especially given the lack of any of the usual sci-fi action, but one that highlights some of the behind-the-scenes aspects of the organization. A moon installation known as the "Dalotek" seems to be responsible for causing radar blackouts on board Moonbase. This poses a major problem, especially when a UFO gets past security because of the radar issues. Col. Straker is convinced the Dalotek team (who do not know what Moonbase is) are inadvertently responsible for the deaths of SHADO personnel. He struggles to shut them down somehow, but other SHADO staff are not so convinced it's entirely a human error. Col. Straker is caught between tough decisions when his son becomes critically ill. The SHADO vessel best able to get him the medication he needs quickly is also the one that best monitors an Alien craft heading towards Earth. Diverting it could be disastrous, but if he doesn't, his son could die. This is a solid episode showing the emotional side of Col. Straker, as well as the dilemmas regularly facing SHADO. An especially weird episode in which Foster, a bit hungover from a night of heavy drinking, is overtaken by aliens who manage to avoid SHADO security. He is kidnapped and placed in a UFO. Again, two issues must be weighed in the balance: Foster's life and getting the aliens. A wounded, crashed alien is killed by a SHADO operative who's having an extra-marital affair, making for another odd episode. These kinds of affairs are frowned upon, but Paul Foster suspects something very strange behind the lovers and the death of the alien. A strange approach to a mystery story. When sensitive rocket mission information makes its way into the public, SHADO's military controllers point the finger at Paul Foster, the only likely suspect. Is he a traitor? Col. Straker doesn't think so, and he goes on a private mission to uncover who's really responsible. Col. Straker cooks up an elaborate plan to figure out where the aliens live. He wants to somehow lure a UFO into a certain orbital position, then threaten it, hoping the ship will return to its home planet. If this succeeds, he can use complex satellite imagery to track the craft and photograph the planet from which the UFOs come. The hard part is getting a UFO to play along, however, and lots of lives could be lost in the process. A clever episode in which SHADO must refrain from their usual strategies in order to make the plan work. This episode is basically a flashback to the days before SHADO existed. After Lt. Grey has a baby, Straker becomes wistful and we take a journey back to the 1970s when Straker was part of the early investigations into potential UFO attacks and the technology to combat them. This is a personal episode that is intended to showcase what Straker's life was like before he had to sign his life away to SHADO. It also shows the deconstruction of his marriage. It's a good episode, and an admirable idea to personalize the show, but it's also very slow moving and a little too 'filler' for my tastes. It can be skipped. The first season of UFO obviously shows a direction towards setting a solid sci-fi universe as well as personalizing it. While not quite as exciting and edge-of-your-seat as some of the Anderson productions, UFO still marks an important evolution for live action sci-fi, I think. One notable thing here is the obvious expense at which the show was made, with amazing detail regarding sets and atmosphere. Obviously, the weird costumes and other eccentric details date the show a bit, but also clearly define the atmosphere and give it plenty of character. Image Transfer Review: The restoration here is quite impressive, if not stunning. Colors are vibrant and eye-popping, which is all for the best since the show is about color schemes and visuals. The source print is cleaned up to virtually perfect condition, with not a sign of dirt or scratches. The minimal grain does occasionally show up, but artifacts and other compression issues are kept to a bare minimum. It's an impressive rendering of a 30-year-old television show that looks as if it hasn't aged a day. 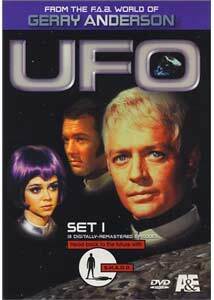 Audio Transfer Review: Unlike certain other Anderson productions on DVD, UFO has not been remixed and remains in its original mono format. This isn't disappointing though, as the soundtrack (which is expanded into right/left channels) is very good. It's very clear and rather resonant, with plenty of room for low bass and high-frequency special effects. It's obviously been remastered somewhat to improve the overall quality, which is easily noticeable. Extras Review: Most noteworthy is the inclusion of a commentary track on the first episode (Identified) by Gerry Anderson, who details many elements of production, such as how UFO got off the ground, and why it was eventually cancelled (and morphed into what became Space 1999). As usual for Anderson, it's a wonderful commentary filled with trivia as well as personal comments and an open sense of humor. In an interesting touch (and one I wish more commentary tracks would use), the audio during the commentary has all of the dialogue removed, making it much easier to understand the speaker. Also included are some outtakes which, rather than being the humorous kind, are alternate takes and extended version of a few scenes from the premiere episode. These allow an interesting look into the progression of the editing and a few minor elements that were left on the cutting-room floor. Production photographs look behind-the-scenes of the show, as well as some rare stills probably used in promotion. Gerry Anderson's biography and filmography are included. The packaging is a transparent quad-Alpha case that has episode details on the reverse side of the outer case insert instead of an actual booklet insert. The on-disc menus are easy to navigate and use minimal animation. Another Gerry and Sylvia Anderson cult favorite comes to DVD in a very respectable, high quality set that shows a lot of respect for the genre. True fans should not pass it up.